Posted February 15, 2010 by Bryan & filed under iPhone. I find myself trying mostly the free apps on the iPhone to see what they are like before buying them most of the time. I’m going to make this a two part post. Suggesting free apps and paid versions. This new Twitter app uses the lists feature just like the web version of twitter. Most of the other paid versions and non paid versions of Twitter for the iPhone don’t have support for #lists, or maybe it’s just the ones I have. 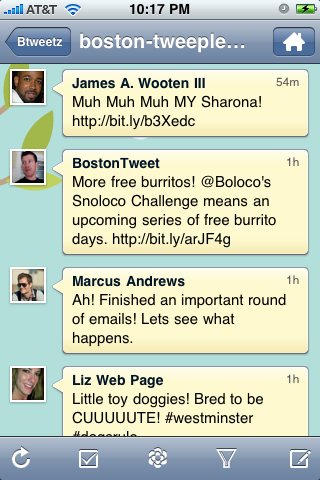 It also lets you ad more then one user and send and view direct messages, and some cool themes.